Shannon DeVido (Melanie) and David Marcus (Ben) in Samuel D. Hunter’s “Geese,” part of TBTB’s MORE OF OUR PARTS. Photo by Carol Rosegg. What does Theater Breaking Through Barriers do? 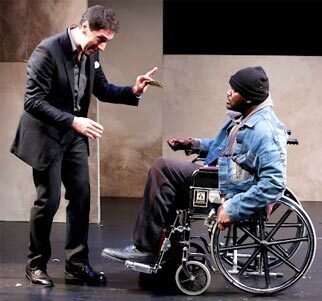 According to its mission statement, TBTB is “dedicated to advancing actors and writers with disabilities and changing the image of people with disabilities from dependence to independence.” This is accomplished not only through the hiring and prominent inclusion of actors and writers with disabilities to work in off-Broadway productions, but also through a 10-Minute Play Festival of commissioned plays about disability. 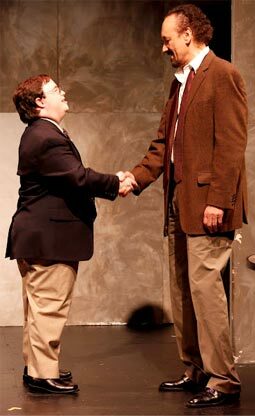 Joshua Eber (Lewis) and Shawn Elliott (Eli) in Jeffrey Sweet’s “A Little Family Time,” part of TBTB’s MORE OF OUR PARTS. Photo by Carol Rosegg. Last year’s inaugural festival showcased the work of seven writers whom theNew York Times reviewers called “an intriguing group of established and emerging playwrights”: Bekah Brunstetter, Samuel D. Hunter, Neil LaBute, Kate Moira Ryan, Diana Son, Jeff Tabnik and Emily Chadick Weiss. 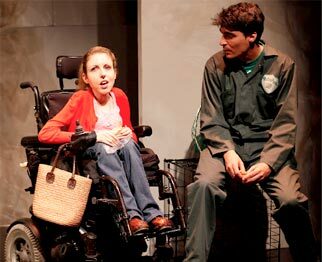 Fourteen actors, many with disabilities, displayed their talents for the 2011 production at the Clurman Theatre on W 42nd Street. This year, TBTB’s More of our Parts, the second installment of the festival, ran from June 20 to July 1 and featured a new set of shorts, several by the same playwrights who wrote for the 2011 production. This time, Schambelan solicited scripts from other sources as well, reaching out to include new and younger writers. He says that although “two writers with disabilities said ‘no’ to me this year, [they] promised scripts for the future.” New to TBTB this year were playwrights Bruce Graham, A. R. Guerney and Jeffrey Sweet. Nicholas Viselli (Guy) and Shawn Randall (Homeless Dude) in Neil LaBute’s “The Wager,” part of TBTB’s MORE OF OUR PARTS. Photo by Carol Rosegg. In 2011, TBTB took several of that year’s ten-minute plays to a festival in Croatia. Actors from Britain and Croatia did small parts in the shows, extending the reach of the festival’s work to an international audience. TBTB More of our Parts performance was held on July 24 on the Millennium Stage, a Kennedy-Center venue whose core philosophy is: the arts are for everyone. Performances there are free and some, like the TBTB production, are streamed live online.